groov – groov Case Studies – Covina Irrigating Co.
groov Case Studies – Covina Irrigating Co.
groov / groov Case Studies – Covina Irrigating Co.
“Bottleneck” is commonly defined as “a point of congestion,” and that’s what Steve Sherman faced. Sherman is Field Operations Superintendent at Covina Irrigating Co. in Covina, California. The Southern California company supplies water to the City of Covina and parts of neighboring communities, and maintains a water distribution network of pumping plants, reservoirs, and water treatment facilities. Covina Irrigating Co. has twelve separate sites in the water distribution system, and at each site Opto 22 control systems monitor and control tanks, pumps, valves, filters, and other equipment. These control systems communicate with a PC at company headquarters running Opto 22’s PAC Display HMI (human-machine interface) software. 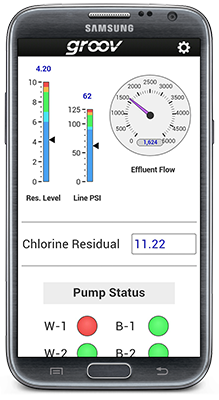 An interface built with PAC Display runs on the PC and displays key operating information for each site like equipment status, water levels, flow rates, and pressures. Steve Sherman, Covina Irrigating Co. The PC-based HMI works well at headquarters, but operators needed to access the HMI while away from headquarters, too. To do so, an operator could run remote desktop software on a notebook PC and then connect to the HMI PC in what’s called a “remote session.” However, only one operator at a time could connect to the PC; other operators couldn’t connect until the current remote session was ended. During busy periods several people might need to connect to the HMI PC. And that’s the bottleneck Sherman needed to eliminate. Learning about groov from his regional Opto 22 sales engineer, Sherman says he “could see its value” right away. He bought a groov Box hardware appliance, set it up at headquarters, and built an interface to monitor and control the remote sites. “It was pretty easy,” says Sherman. Opto 22 control systems at the remote sites communicate back to the groov Box just as they do with the HMI PC. The HMI PC remains, and now provides detailed information and logs for analysis. The bottleneck is gone. To monitor and control equipment at a remote site, an operator opens a web browser and securely logs in to the groov interface. All the other operators can log in simultaneously. Adding groov gave operators another advantage: mobility. Because groov runs in a web browser, they’re not limited to notebook and desktop PCs. Instead, they can use almost any mobile device with a modern web browser—like tablets and even the smartphones in their pockets.